The canny folk behind Brasserie Zédel took a former nightclub and turned it into a classic Parisian brasserie. The result is something extraordinary: a place that feels like a treat but offers remarkable value for money. From an unassuming entrance, you descend to the basement and a vast, gilded, column-filled, marble-clad dining room housing some 220 tables. Evenings often bring live background music, and for those wanting to make a night of it there’s a separate bar and even a cabaret club known as Crazy Coqs, a venue in its own right. The food fits right in. I’ve still not tired of the prix fixe menu; the starter manages things I never knew you could do to a carrot, and the steak haché is peppery and flavoursome. If you’ve a different French classic in mind, they’re likely to do it well. I love having Brasserie Zédel up my sleeve for whenever I need a great West End dining experience on tap. It offers enough grandeur for a special occasion, the efficiency for pre-theatre bites, and even the hustle and bustle for solo dining. Bookings are welcomed – an increasing rarity in London – but walk-ins seldom wait longer than it takes to down one of the bar’s reliable cocktails. The service flows beautifully, from the top-hatted doorman to the complimentary cloakroom, not to mention the respectful-but-attentive waiters. 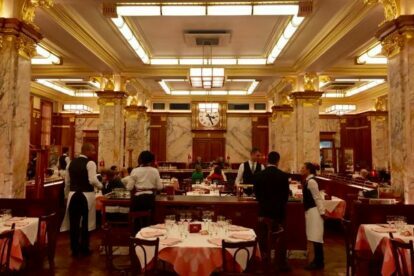 Brasserie Zedel serves up a big helping of Paris, and not just any Paris; this is charming, polished, friendly Paris for a very fair price.